A team of palaeontologists and field workers are busy extracting the fossilised remains of a Permian predator, a Dimetrodon, that has been nicknamed “Wet Willi” by the excavation team. The scientists from the Houston Museum of Natural Science (Texas), including Dr. Robert T. Bakker, the curator of palaeontology at the museum, are busy, carefully excavating the articulated specimen of this ancient carnivore from 287 million year old strata in Baylor County. “Willi” as he is known (although at this stage identifying whether this is a male or female is a very complicated issue), is a species of Dimetrodon called Dimetrodon giganhomogenes, originally described in 1907. However, this is the first Dimetrodon of this species to be found with most of the skull material intact. The researchers gave the fossil the name “Wet Willi” – because the bones were first seen whilst a team of construction workers dug a drainage trench for the quarry site. The second part of the name is for Samuel Williston, a renowned palaeontologist of the early 20th Century who conducted a number of excavations of Permian aged material from this location. The picture shows some of the rod-like extensions that supported the sail which was on the back of Dimetrodon, an anatomical trait that Dimetrodon shared with other Pelycosaurs, the purpose of which, remains a mystery. Single Dimetrodon bones are occasionally found at the Craddock quarry dig site, but the discovery of an articulated, almost complete specimen is an exceptionally rare event. Most of the mounted Dimetrodon exhibits seen in natural history museums around the world are constructed using material found in the north of Texas. This part of the United States with its significant quarries and prominent exposures of Permian aged strata is one of the most important locations in the world for Permian aged vertebrate fossils. In life, “Willi” was one of the apex predators of the world during the Permian. Although, Dimetrodon models and toys are often included in dinosaur model sets, Dimetrodon was not a dinosaur, in fact as a synapsid, it is actually more closely related to mammals than to the dinosaurs. The large sail-like structure on the back of Dimetrodon, was supported by rod-like extensions of the backbone. Scientists remain uncertain as to why these Pelycosaurs had these anatomical features. 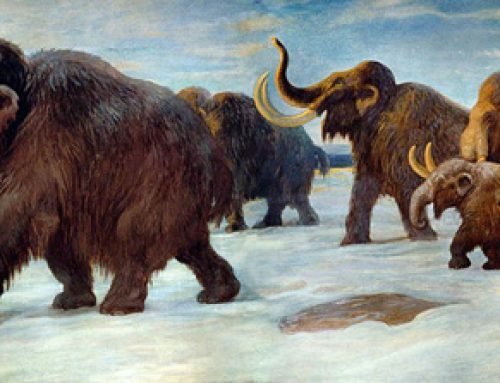 They could have been used for display or perhaps acted like giant radiators and were used in some form of thermoregulation. Most of the specimen seems to be present, the only elements missing are parts of the lower jawbone, elements of the limbs and the caudal vertebrae (tail bones). “Wet Willi” will be the star of the Permian section of the Museum’s newly renovated palaeontology hall, which is due to open in 2012, and will serve as a focal point for this part of the museum. The Permian outcrops in Texas are an excellent portal for learning about this important and enigmatic period in Earth’s history. The Permian ended with the worst mass extinction known, and was a direct precursor to the rise of dinosaurs. At present, the Museum has a mural of the Permian Period featuring a Dimetrodon, but no fossils on display. Over the past five years, the Houston Museum of Natural Science field crews under the direction of Dr. Robert T. Bakker, have collected hundreds of bones, teeth, and coprolites (fossilised dung), as well as complete skeletons of the smaller reptiles and amphibians that lived alongside the fearsome Dimetrodons. They have been able to build up a picture of the environment in prehistoric Texas, with its bizarre flora and fauna. Dr. Bakker went onto add that he thought the skeleton was “jaw droppingly beautiful”, certainly, the finding of such a complete specimen is an exceptionally rare event and with the relatively intact skull material, perhaps more can be discovered about the way in which these large predators interacted with their environment.